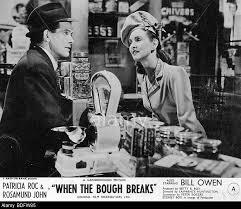 ‘When the Bough Breaks’ (1947) stars Patricia Roc and Bill Owen. A strange combination at a cursory glance – especially as they end up married – but it works! I thought that this was the best new-to-me film that I had seen in a long time. I don’t know if this is because it just caught me in the right mood, or if it is a half-forgotten treasure. It is an all-out weepy and I felt much better for getting into the spirit of the thing. The storyline can be roughly sketched out as follows. Patricia’s character (Lily) has a baby and immediately discovers that her husband is a bigamist. She tries to bring her baby up alone but she struggles – as you would in those days. A posh lady at the nursery takes a shine to her son and at a particularly low point, Lily allows her to informally adopt him. Fast forward a few years and Lily has a good job in a department store. She goes on holiday to Butlin’s and meets the adoring and persistent Bill (Bill Owen). I was gratified to see that they met in the typical 1940s matchmaking dance, also used to good advantage in ‘Millions Like Us’. All the women form a circle, all the men form a circle facing them, and they do a big opposite directions ring-a-ring-a-roses until the music stops (‘Here We Go Round the Mulberry Bush’). A quaint way of meeting new people that I regret the loss of. Also gratifying is the presence of Leslie Dwyer at the holiday camp – he went on to become the grumpy Punch and Judy man in ‘Hi-di-Hi’. Lily says that she can’t marry Bill but won’t tell him why (Oh the melodrama! I lapped this up!). Eventually, he prises her past out of her, and being a thoroughly good egg he still wants to marry her and at last she becomes chatelaine of his corner shop in Streatham. Settled – but with no babies forthcoming from Bill – she seeks out her son, now eight years old. She gets him back – but it is no good, she and her son are strangers. She hands him back to his adoptive parents. Perhaps one of the reasons why I identified so much with this film is because I identified with Lily’s struggles with her new born baby. Being alone in the world and refusing to receive any support from her bigamist husband meant that she had to go to work. After a period of standing at a perfume counter all day and pacing up and down with a crying baby all night, she finally collapses. This is rather melodramatic to our eyes perhaps – but to be a working mother was much more unusual and therefore open to interpretation in the late 1940s. Women were expected to give up jobs to returning servicemen and dedicate their existences to delivering the baby boom. Yet even in wartime, mothers of young children were not conscripted into jobs. I found myself going back to work too soon after the birth of my first child. Financial need dictated this. I had a traumatic caesarean in October and was back at work after Christmas, my daughter going to a day nursery. She was a difficult baby – I called her Lucifer because she screamed all night and slept all day and it seemed that nothing would persuade her to review her hours of business. I have a vivid memory of sitting at the top of the stairs weeping in utter misery because she’d cried all night and I had to be at work in three hours. Yet the nursery staff thought she was a delight – just like in the film. I fantasised about running away…and I sometimes worry that if I did not have support from others then I might have done something regrettable. What is identified as being suitable melodrama material here is now normal everyday life for most of us. My story is not unusual, there are thousands of others out there with similar experiences. But I wonder, do we choose to live like this or has it been forced upon us? Mothers of babies are now expected to work, both by society and the government. The cost of living is such that one wage per household is not enough – recent statistics showed that a large proportion of households claiming Housing Benefit do have a member in employment. To have to live on one wage leads to reliance on expensive credit and potentially damages the life chances of the children. Some mothers enjoy working though and are glad to keep an identity other than ‘Mummy’. Some hate and it and resent how it exhausts them and means that they cannot be there when their babies are learning to walk and talk. Personally I felt a mixture of both. And as I said above, not even Winston Churchill expected young mothers to go to work in Britain’s darkest hour. What a conundrum this is. But at least we are not in fear of being morally judged when we have been left in the lurch by the fathers of our babies (not to say that people don’t judge – but we are more able to ignore it). For this reason alone, perhaps we have made some progress. It just doesn’t feel like it at times.